Aside from the fact that when Apollo 11 blasted off from the Kennedy Space Center in Florida it had to “ascend” into space, it would seem like one would have to make a “giant leap” to connect the first successful moon landing with the small, nearly uninhabited Ascension Island in the South Atlantic Ocean. But that’s where you’d be wrong. There’s actually a HUGE connection since that’s where NASA built a tracking station in support of its Apollo Program and where Neil Armstrong’s first words were received before being relayed to Mission Control! In addition, Pobjoy received special permission from NASA to use the space agency’s famous logo. The logo along with the planet Earth, dual dates of 1969 & 2019, and ONE CROWN denomination are all featured on the reverse of the coin along with the Image of Armstrong saluting the flag in the foreground. Your 2019 Ascension Island First Man on the Moon 1 Crown Silver Coin has been graded by the Numismatic Guaranty Corporation (NGC) as being in flawless Proof-70 (PF70) condition, a distinction that means your perfectly-graded proof will have ZERO imperfections – showing all features and fields exactly as the engraver and mint intended. In addition, NGC has certified that your proof is a First Day of Issue (FDI) coin, meaning it was received by NGC or an NGC-approved depository by the release date or on the business day within 24 hours of the official release date. Situated in the Devil’s Ashpit on Ascension Island, a volcanic and lunar-looking area that is highly conducive to receiving radio transmissions, NASA’s tracking station on the remote island is also part of a wild conspiracy theory. According to some conspiracy theorists, Neil Armstrong didn’t really set foot on the moon; he actually stepped out onto a field in the Devil’s Ashpit! Whether you believe the urban legend or not, it makes for another cool connection between the tiny island and Apollo 11, adding another collectible element to this fascinating proof. Add one of these coins to your orbit by clicking one to your cart today! COMMEMORATES 50th ANNIVERSARY OF FIRST MOON LANDING – Featuring the image of United States Astronaut Neil Armstrong saluting the American flag on the surface of the moon, this coin commemorates the 50th anniversary of NASA’s Apollo 11 mission – the first successful moon landing. The obverse depicts a regal portrait of Queen Elizabeth II. STRUCK IN BRITISH STERLING SILVER – Each 2019 Ascension Island First Man on the Moon Silver Proof was struck by the British Pobjoy Mint in 28.28 grams of highly-pure 92.5% British sterling silver. LEGAL-TENDER COMMEMORATIVE COIN – This 2019 Ascension Island First Man on the Moon Silver Proof is 1 Crown legal tender on Ascension Island, an isolated island in the South Atlantic Ocean located half way between South America and Africa. 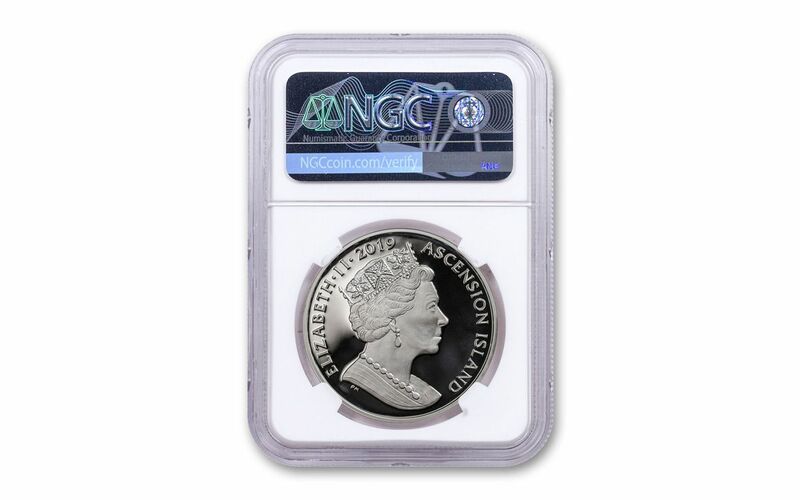 GRADED IN PERFECT PROOF CONDITION – Your 2019 Ascension Island First Man on the Moon 1 Crown Silver Coin has been graded by the Numismatic Guaranty Corporation (NGC) as being in flawless Proof-70 (PF70) condition, a distinction that means your perfectly-graded proof will have ZERO imperfections – showing all features and fields exactly as the engraver and mint intended. KEY FIRST DAY OF ISSUE CERTIFICATION – NGC has certified that your Man on the Moon proof is a First Day of Issue (FDI) coin, meaning it was received by NGC or an NGC-approved depository by the release date or on the business day within 24 hours of the official release date. LOW LIMITED EDITION – The Pobjoy Mint struck only 5,000 of these commemorative proofs for worldwide release. Don’t delay; with only 5,000 of these impressive silver proofs available for worldwide release, the time is now to reserve your coin before they’re all gone!